A student can pursue a group yoga class alone or use it in combination with one-on-one yoga therapy and/or Thai bodywork to enhance the effect of a personal yoga and meditation practice. -Teresa Little, student and member of Atlanta Friends Meeting. ﻿﻿Kundalini yoga is a comprehensive style of yoga that combines postures (asanas), breathing (pranayama), hand positions (mudras), mantra (chant) and meditation to release tension from the body, build physical strength, endurance and flexibility, and clear and focus the mind. Kundalini yoga takes its name from the kundalini energy, which is the energy of the highest human potential. This yoga is taught in the style of Yogi Bhajan, an East Indian teacher and healer who immigrated to the United States in the 1960s. Although Yogi Bhajan died in 2004, his teachings have spread internationally. His 3H0 (Happy, Healthy, Holy) Organization continues to operate out of headquarters at Yogi B's Ashram in Espanola, New Mexico. A client can pursue one-on-one yoga therapy alone or use it in combination with a group yoga class and/or Thai bodywork to enhance the effect of a personal yoga and meditation practice. Integrative yoga therapy is a system of yoga postural assistance and corrections, mudra and pranayama, and meditation. It also includes advice on nutritional and lifestyle issues and choices that can aid in maintaining good health, excellent spinal posture and overall physical fitness. Based on traditional Western anatomy and physiology, simple yoga postures and Ayruvedic medical and dietary principles, integrative yoga therapy can help clients achieve optimum wellbeing. Yoga therapy also can help in alleviating specific physical conditions and illnesses. An initial session will last 90 minutes, including time to complete a client intake form. Follow-up sessions last either 60 or 90 minutes. Subsequent sessions: $60 or $75 each, or a series of 4 sessions over three months or less: $216 or $270. Yoga for Menopause/Perimenopause: This is a restorative and gentle approach to yoga for when we most need it yet least often have time for it. Sessions are custom designed and include tips on easing bodily shifts and changes through postural adjustments, prescriptive asanas and powerful breathing and meditation techniques. Pregnancy Yoga: A custom approach, this yoga therapy can help during each trimester to ease body changes and resultant physical stresses, and/or to prepare a woman to slip into the new roll of motherhood or to the expanded responsibilities of an additional child. Beginning Meditation: It’s often difficult to slip into the required “nothingness” state of meditation. 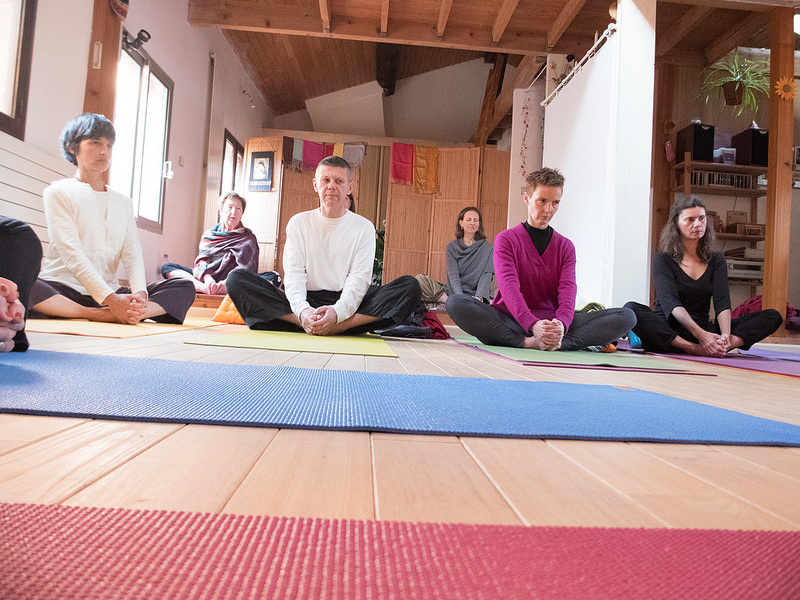 These sessions begin with simple asanas designed to ground the practitioner in his or her body. These are followed by techniques to focus the attention in two ways on the breath, thereby leaving little room for the activities of mental chatter and restlessness. Yoga for Athletes: The true polar opposite of being ready to compete and excel at your physical and mental peak is to be deeply still and quiet within yourself. And in this state of visiting the extreme opposites, as an athlete, you will find your yogic balance. The stretches, counter movements, meditations, and deep and focused breathing of this yoga therapy will allow you to access all parts of your true potential—as athlete and human being. Yoga for Cancer Survivors: A steadiness, caring and sense of connection to self can be found at the heart of this yoga therapy that supports a client through his or her experience. Gentle, non-impact yoga stretches, breathing techniques, mudras (hand positions) and meditations provide a safe, calming and expansive space for healing. These therapy sessions are about “being” and “allowing” rather than “doing.” The sessions ask you to become fully present. A client can pursue Thai Yoga Massage, also known as Thai bodywork, alone or use it in combination with a group yoga class and/or one-on-one yoga therapy to enhance the effect of a personal yoga and meditation practice. Thai Yoga bodywork is a gentle system of assisted stretching and direct muscle contact that helps a client relieve tension and achieve relaxation. The massage is performed on the floor on a customer-designed mat; the client remains fully clothed. Subsequent sessions: $60 or $75 each, or a series of 4 follow-up sessions over three months: $216 or $270. Ann Ritter trained in Montreal, Quebec, Canada, with Kam Thye Chow at The Lotus Palm School of Thai Yoga Massage in 2002 and 2003. She received her certification in October 2003. Her teacher, Kam Thye Chow, is a master and teacher of the Northern Style of Thai Massage and has adapted his highly precise and systematic regime of Thai massage to suit the particular physical needs of clients in the West. Get Updates about our sessions!